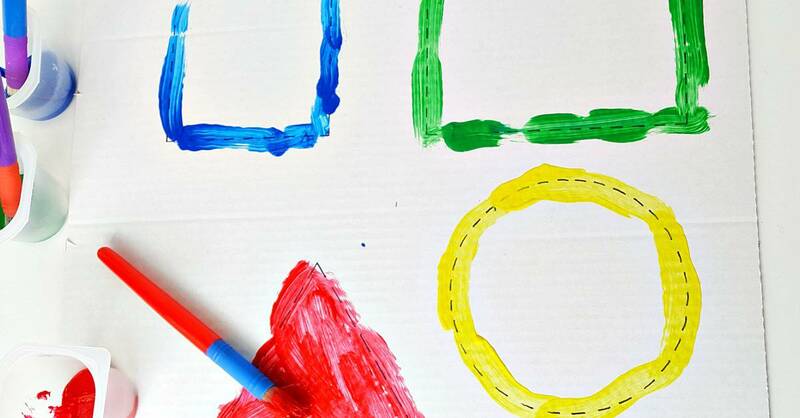 Have you tried painting shapes with your toddler? 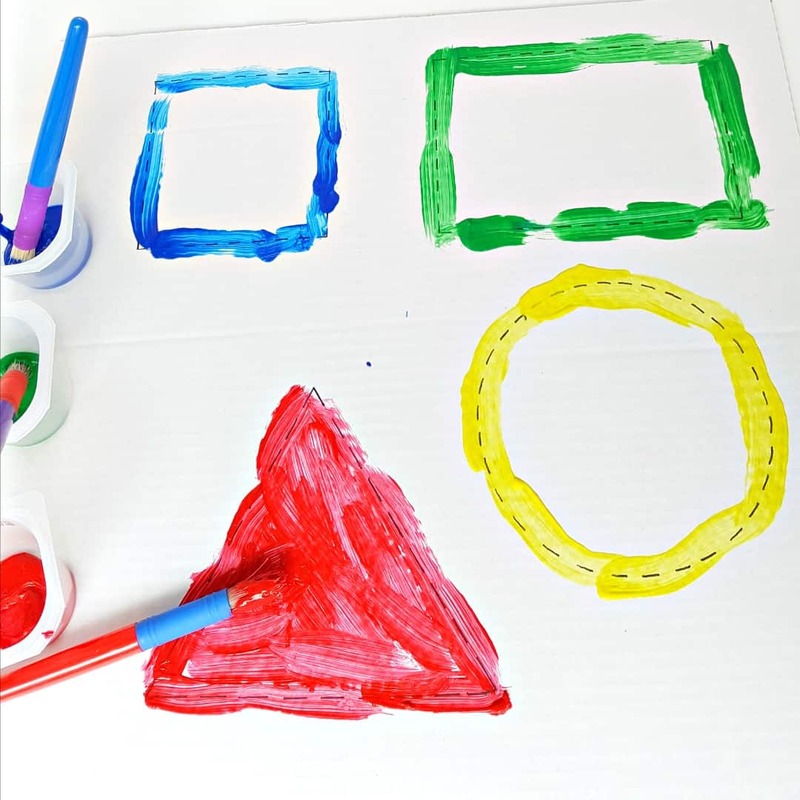 We all know that painting is always fun for toddlers, and painting shapes is a great way to add some hands-on math to the activity too. Explore shapes with colorful paints in this creative art math activity. Discovering shapes is almost a daily activity for toddlers. As they explore their surroundings with all their senses they see and feel a variety of shapes. This might include bouncing a ball at playtime, eating a soda cracker at snack time, or fitting a triangle shape into a puzzle during quiet time. In this painting activity, your toddler will form shapes by tracing dashed lines with a paint brush. Once they have completed a shape, they can finger paint inside the shape, make a handprint inside the shape, or paint with a paint brush. Washable Paint – I always recommend this one. How to set you your shape painting activity. 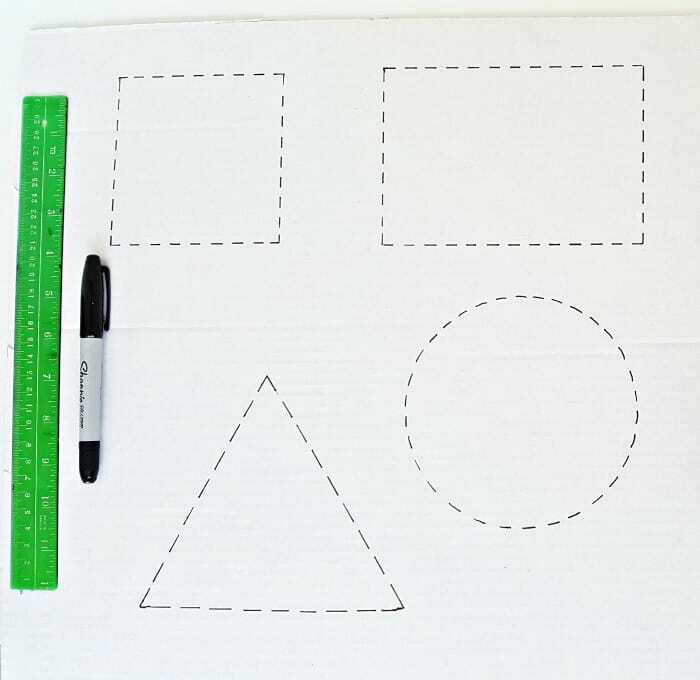 Draw shapes on a cardboard canvas. A clean pizza box is ideal for this painting activity. Use a black marker or draw each shape with a different color. Draw shapes free hand or trace around available shapes. Use a ruler to space small dashed lines for your toddler to trace. 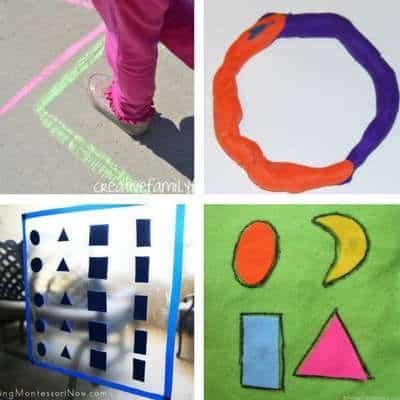 Your toddler can follow the dashed lines to outline the shape. Paint the shape completely with a paint brush, or finger paint inside the shape. Guide your child in the use of the materials while leaving room for exploration and discovery. Mix colors, trace shapes with finger tips, or make hand prints inside the shapes. Allowing your toddler to lead the way will provide an outlet for fine motor, cognitive and creative skills. 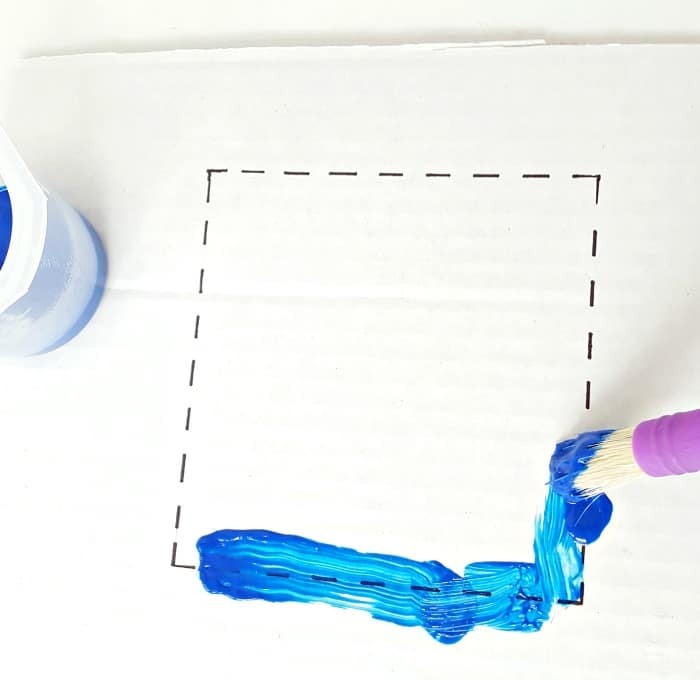 This shape-painting activity is a great way to initiate a conversation about shapes and colors. Talk about the colors used. Look for similar shapes in the room. Paint shapes free hand on a clean piece of paper or cardboard. Painting activities are opportune times to provide fun and learning for toddlers. This simple activity is open-ended, making it perfect for toddlers regardless of age or skill level. 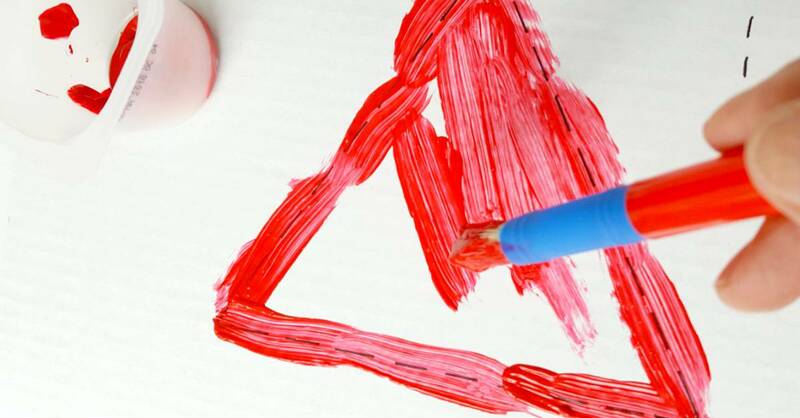 Enjoy some shape painting with your early learner! Share your ideas and pictures of how you play in our Facebook Group or on Instagram (use #MyBoredToddler so we can all see!) 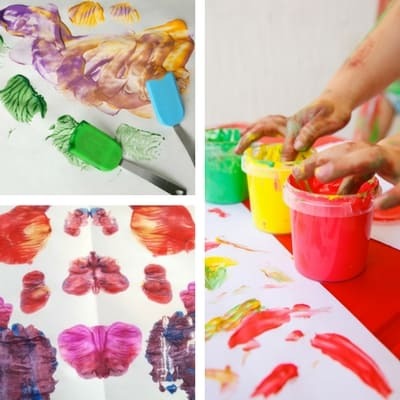 You can also follow our Pinterest boards for lots more toddler activity ideas. 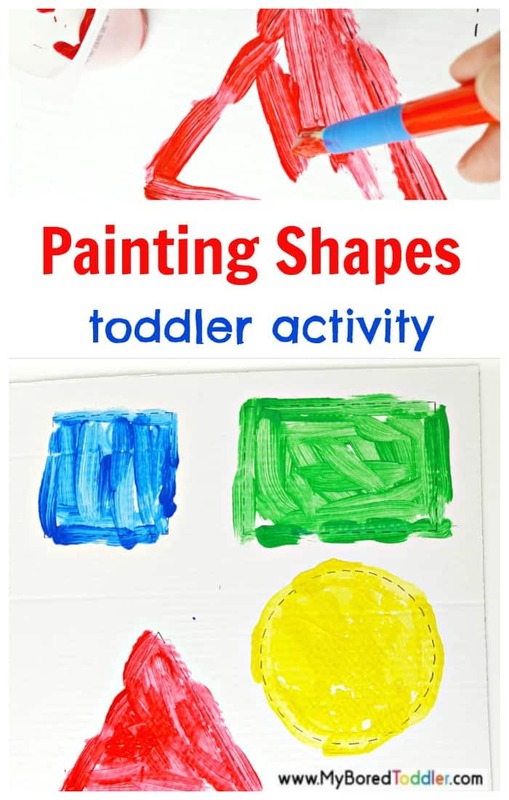 If you love this painting activity you’ll also love our collection of over 20 Easy Painting Activities for Toddlers and our collection of Shapes Activities for Toddlers. 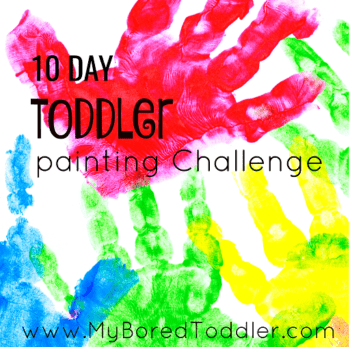 You can also join our FREE Toddler Painting Challenge. « Sensory Bins for Toddlers – 6o Sensory Bin Ideas!